It’s not too immodest to say, but Scotland is hard to beat for lush landscapes and beautiful scenery. With so many world-class resorts a mere hop, skip and a jump away, it’s tempting to stay resolutely north when booking a leisurely weekend break. But sometimes a change is as good as a rest and some of England’s loveliest spots are very close to home. Case in point is the glorious Lake District and the delights of the four star Lakeside Hotel and Spa. 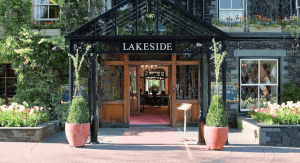 Located on the shores of Lake Windermere, the hotel offers guests the best uninterrupted view of the miles long lake and a luxury stay that I, for one, could get very used to. On arrival our car was valet parked and our bags whisked to our bedroom by a cheery porter, who explained the first rule of Lakeside is to relax and let the staff take the strain. The hotel is a very grand but beautifully preserved old lady. Formerly a 17th-century coaching inn, it still boasts many of its original features such as oak panelling and timber beams, but it has been expertly extended and is one of the best marriages of traditional and contemporary design I’ve witnessed in a long time. Along with a new conservatory and impressive spa, the stables have been converted to provide additional accommodation, with the majority of bedrooms taking in the magnificent lake view. After freshening up in our bedroom, furnished with pretty period furniture, a super sized bed and an ultra modern bathroom, we contemplated having our pre-dinner drinks in the atmospheric, oak-lined bar but as the sun was still shining we wandered out to the terrace to take in more of that amazing view. Because of its secluded setting, you’d probably need to drive or at least take a 10 minute hike to a local restaurant but I’d thoroughly recommend either of the hotel’s two restaurants; the formal 2 AA Rosette Lakeview Restaurant which serves classic and Cumbrian based dishes such as Muncaster Crab Ravioli, Belted Galloway Chateaubriand and Line Caught Lune River Salmon, and John Ruskin’s Brasserie which offers a more contemporary but no less special dining experience. Should the Ham Hock & Confit Chicken be on the brasserie menu on future visits, it’s a definite second helping, along with the excellent red Rioja. Next day, after a first class silver service breakfast, we took the short stroll to the landing jetty just outside the hotel’s reception ar ea and boarded the steam boat to Bowness, a small town which lies on the other side of the lake. The crossing costs £9.80 per person return and takes roughly 40 minutes. Bowness is a pretty little place with plenty of interesting shops and a fair smattering of pubs, and worth making the crossing for. On our return we stopped by the hotel’s health and leisure spa – home to a 17metre pool, a steam room and traditional sauna, poolside jacuzzi, gymnasium and three spa treatment rooms with private relaxation area. The spa is also the only Aveda lifestyle spa in England (the only other can be found at Mar Hall) so if you like your beauty treatments, be prepared to book well in advance. While we were definitely in R&R mode on our visit, even the most active of visitors would find something to keep them occupied here including guided fell and woodland walks and electric bike hire. Our weekend stay was all too brief but we promised to explore more of the local attractions, and that magnificent lake, the next time we stay at Lakeside. After all, the water is lovely.